Oklahoma offers a multitude of glistening lakes, rushing rivers, and beautiful reservoirs just waiting to be explored. There’s no better way to make the most of these waters than atop a boat. Boat rental companies across the state offer everything from thrilling speed boats, to relaxing sail boats, to kayaks that will give you a good workout. Here are 10 of the best boat rental companies in the state. One of the nicest things about Lake Murray water Sports is that it offers multiple types of boats, from canoes, paddle boats, sailboats, and motorized watercraft. They even have lessons available. At Beavers Bend Marina, you’ll find jet skis, pontoons and other options for a day, a night or even a whole vacation at the lake. They even rent houseboats, or you can camp nearby in the state park. CrossTimbers has ski boats, pontoons, and jet skis for rent when you’re on Skiatook Lake. The lake is one of the prettiest in northeast Oklahoma, and it has over 10,000 acres of water to explore. Shangri-La Resort recently reopened and this area is booming. At the marina, you can rent a watercraft, a boat, or even go parasailing for a few hours on beautiful Grand Lake. Evergreen Marina serves Lake Eufaula with houseboat rentals, jet skis and pontoons for the summer fun day you want. You can stay at the marina in your RV or in a cabin, or you can camp in one of the nearby state parks. Burnt Cabin is a resort near Lake Tenkiller, and it offers jet skis and pontoon boats. The pontoons are rated for 14 people, and the marina provides life vests for everyone in the group. They have camping and cabins if you want to stay close. This marina serves Fort Gibson Lake with pontoons, aqua-trikes and pedal boats. Life jackets are provided. The owners are local and know the water. If you want to try something out before you buy, talk to these guys. Keystone Harbor boasts on its website that it has the “most diverse and exciting boat rental fleet in the Tulsa” area. 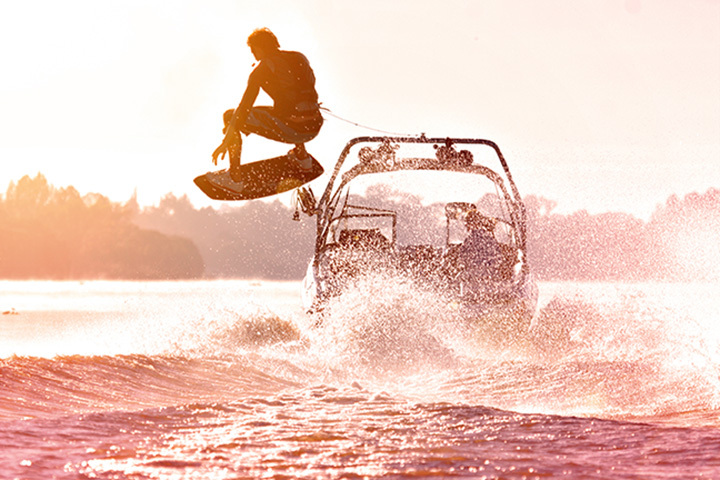 Ski boats, pontoons, slide boats and wave runners are available, as are many water accessories to make your day in the sun on the water the best day ever. This marina serves Kaw Lake with boat and wave runner rentals. It has new owners as of this year, but they seem to be making the marina a community feature again. Fort Cobb Lake is a nice place to spend the day or a weekend, and Sunset Cove Marina has the water equipment you need to have a great time. It has a small café where you can get a quick meal to keep you fueled.